All Along The Watchtower is a simple song on the ‘ukulele that would be a great first look at the sound of a minor key for a beginner. 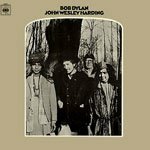 I’m partial to Jimi Hendrix’s version of the song – probably one of the best covers ever – but since Dylan wrote it we’ll put his name in the credits. If you want to play All Along The Watchtower on your ‘ukulele like Hendrix, the chords will be in the key of C minor. Just move what’s written down a half step from C#m, B, A to Cm, Bb, Ab. Here’s a reference of ‘ukulele chords if you get lost.